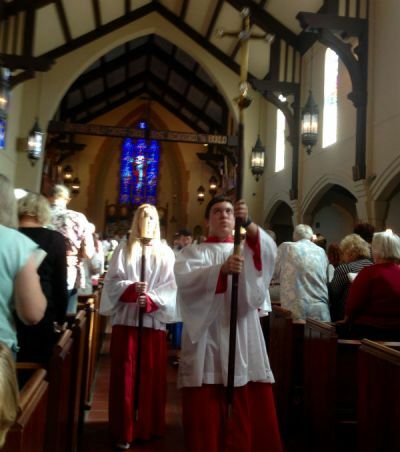 Reading, being an acolyte, ushering -- there are many ways to get involved in worship ministries at St. Cross! Fifth graders and older are welcome to help lead the St. Cross liturgy with their acolyting skills. Contact the office for more information about acolytes! Intercessors read the prayers of the people in worship. To learn more about becoming an intercessor, contact the office. Lay Eucharistic Ministers are trained in both liturgy and the interpretation of Scripture. These parishioners serve at Sunday services by administering the chalice (of wine) at communion. Call the office to learn more about how to become a LEM. Lay Eucharistic Visitors are parishioners trained by the parish and licensed by the diocese to share the Holy Communion with fellow members who are hospitalized or otherwise unable to come to church. LEVs are sent forth by the whole congregation from a Sunday Eucharist, bearing the Sacrament in a small communion kit. To learn more about this ministry, contact the office. Lectors read assigned readings every Sunday in our worship services. Anyone is welcome to become a lector and we provide training on how to read from the lectern and where to find the assigned readings. Experience in speaking in front of people is helpful but not a requirement. A schedule is set ahead of time and generally lectors read once a month.